I remember going to the Toy Fair this year and stealing glances at Trucky 3, a logic game/toy. An enthusiastic explainer at the Smart Toys and Games booth showed some of the games to me but then my eyes wandered off to a tall magnetic structure and it was hard to look at anything else. I asked how much the magnetic toy set was and when they told me, I had to let it simmer in my head before having an opinion about it. 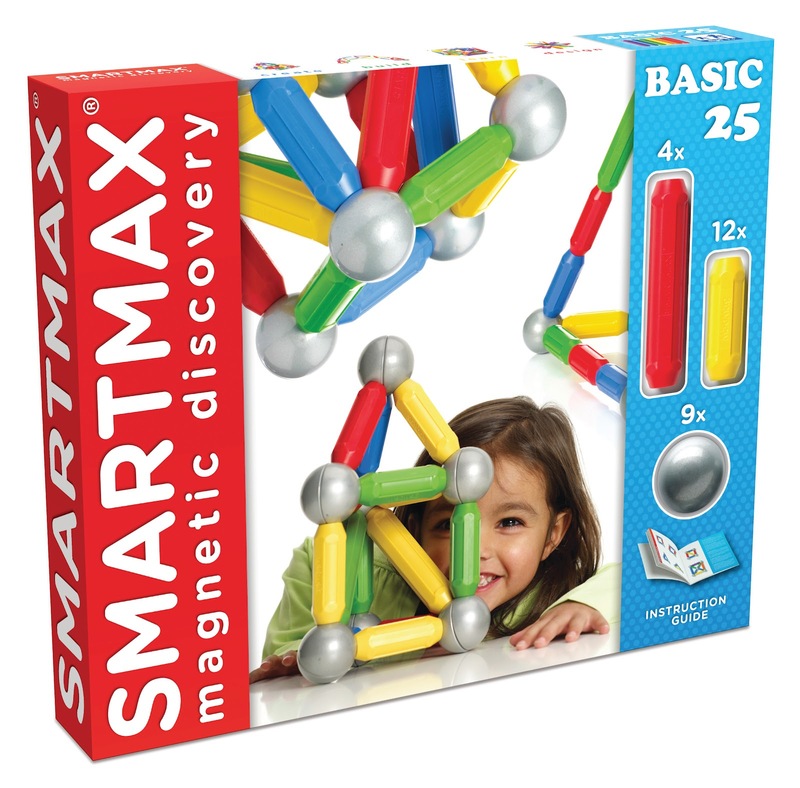 It's hard to compare magnetic toys and their prices. They are all so different. Still I kept on staring since I can stare for free. And truthfully, after our fantastic experience with Tegu blocks, I have become very open to magnetic sets and this one had wheels and ramps and propellers and flowers and .. oh.. I'm getting ahead of myself. Is an Investment Considered an Expense? Let's just stick to the balls and rods for now. But before that, let's get the money part out of the way: Yes, the price of this particular set is more than what I normally spend for a toy and no, I didn't buy this set. It was submitted to Toys are Tools for review. But wait! Ask me if I think this toy is worth the money? My answer? You betcha! And wait until you hear my ideas for a strategic growth plan (in your toybox) for toys like these - it's coming soon! In fact, whenever I look at it, I am reminded of all the "quickly-forgottens" I bought when my kids were younger and even now. I then start to compute the dollars wasted and before computing how many SmartMax sets I could be owning instead, I have to stop myself to prevent depression. Now, as I look ahead, I try to think about how I should save my money and just invest on a high-quality toy that will grow as my children's minds grow. SmartMax looked like a good candidate for this category. When I look at a toy like SmartMax, I have to ask an expert for help and David Wells, the Curriculum Developer at the New York Hall of Science (NYSCI), a children's science museum, is perfect for this job. David is a multi-media artist, a museum educator, a former preschool teacher, and a musician too! Soon after we started talking about SmartMax, our conversation naturally led to discussion about toys that could grow with a child. David explained how that can happen from a learning perspective. I love this video. This was his first day playing with SmartMax but he took to it so easily. He even "explained" it to me. We talked about how a 1-year-old might experience SmartMax. David had actually brought them to a friend's home. They had a 1-year-old and a 4-year-old. He talked about how sturdy the magnetic rods were since the littlest one was sort of rough with them. 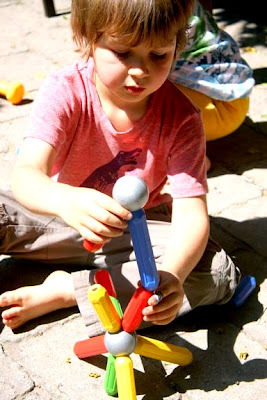 Soon, he spoke of how a 1-year-old might take two pieces and see that they connect and then you might see him do it again on purpose. "Once they do get that, then they are seeking it out and that sets them up on their next stage as they develop a little bit more and make consecutive connections," David said. "That’s something that I thought is successful with toys -when they can span different developmental ages successfully," he continued. "It doesn’t mean that a 3-year-old is getting the same out of it that a 1-year-old is but what’s important is that the 1-year-old is getting something out of it and the 3-year-old is getting something out of it and the 5-year-old is. And so on and so forth." I wish I met David Wells when my kids were 3 years old. I would have different toys and they would probably still be here. David also gave me another reason to like this toy. 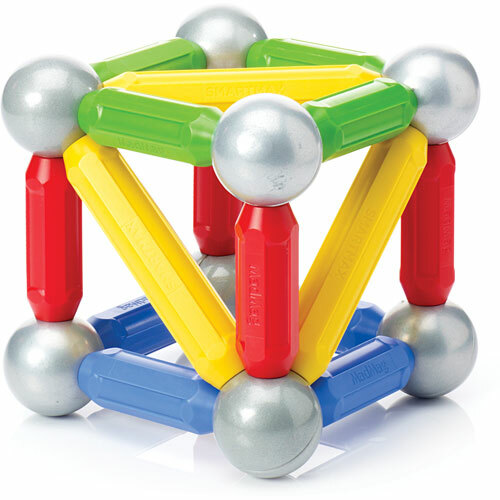 Magnetic toys can be a toy with other things. If you can make it stick to something (ie. refrigerator) then you made a new connection. 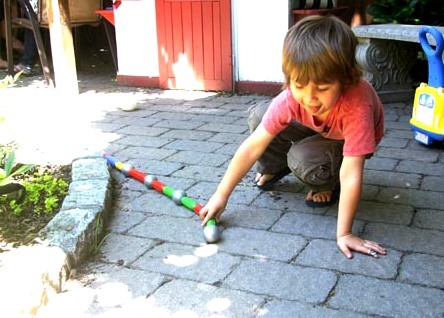 When David played with his friend's 4-year-old son, David took a rod and stuck it onto a metal outdoor patio table. He then described the children's awe, "You know this whole door opened up. They could combine this toy with something metal and that not only expands their creativity and the kind of perspective or the potential of the toy, so, it shows them the concept of magnetism without necessarily being able to explain it." Wow, while I love explaining toys here, I would love TO NOT HAVE TO explain the concept of magnetism to my kids. To be sure, I really haven't had to! Phew! David explains why. "I think play doesn’t get enough credit for its learning capability," he said. 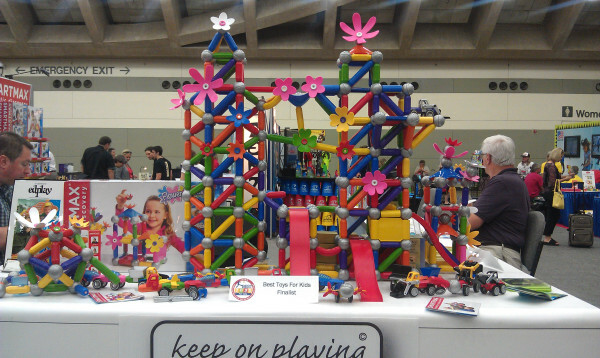 "This is why I’m a such an advocate for building toys. They are intuitive, but they are constantly challenging you." David explained to me that, as kids are playing, they are challenging themselves to continue to figure things out. He then brought up the idea of flow, a concept introduced by Mihaly Csikszentmihalyi in his groundbreaking book Flow: The Psychology of Optimal Experience. "You don’t want to do something too easy but you don’t want to do something too hard," David said. "But I think open-ended toys really kind of walk that line very well and that is why I think it can span several developmental levels." I haven't read it yet but Flow is in my iPad and I can't wait to learn more. But if I look at the construction of the set, then I would guess that SmartMax would be a great candidate to be a medium for promoting that self-generated creative fluidity that we are all seeking for our kids. When I talked about SmartMax with David, I was reminded of a pricey black sweater I own. I think it was about $250 dollars! I was a twenty-something with no kids and no husband and I needed to own this sweater after I tried it on in Bloomingdale's. I wore it as often as I could. I even got asked out on a date wearing that sweater. I wore it so much that if you ask me now what was the best deal I got in sweaters for those several years, I would tell you it was that sweater. Yes, of course, I need to buy other clothes and of course none of them cost as much as that sweater but, that sweater did just about everything for me. If I could still fit into it (ARGH! ), I'd still be would be wearing it today! Remember, my quality-building/creative-toy growth strategy is coming soon! Don't miss!!!! 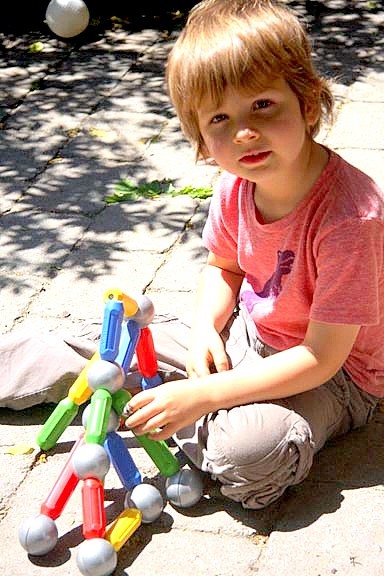 A big heartfelt thank you to the family of this beautiful boy who shared his creations with us! He looks likes he knows how to have fun! I love it! Disclosure statement: Toys are Tools has not been compensated in any fashion by the manufacturer or retailer of any of the mentioned products for the publication of this post. The product was given to Toys are Tools' testers and the expert quoted here to facilitate a review. Reviews are never promised. Very cool! Liam has a set similar to this but they are small (think the size of Lego) I love the big size! We love, love, love these and playw ith them daily. They are msot often used as light sabers right now, but have been game pieces, building blocks, mic stands, pianos and so much more. All three of mine lvoe these!!! We love, love, love these and playw ith them daily. They are msot often used as light sabers right now, but have been game pieces, building blocks, mic stands, pianos and so much more. All three of mine love these!! !